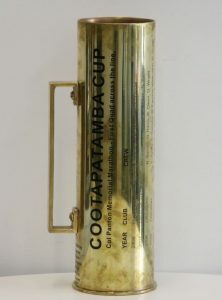 The Cootapatamba Cup was initiated in 2006 as a perpetual trophy to be awarded each year to the first quadruple scull across the finish line in the annual Col Panton Memorial Marathon on Lake Burley Griffin. The ‘Coota Cup’ can be won by crews of any age, juniors to masters, and any gender, including mixed crews. The Cup was donated by the owners and previous owners of a 1993-built Sykes quad scull, Cootapatamba, that has been rowed from the Canberra Rowing Club shed in Yarralumla Bay since its purchase from the Australian Institute of Sport in the late 1990s. The owners in 2006 were long-time Masters rowers David Boughton, John Daley, Graham Humphries, Rodney Moss and Michael Peedom (affectionately known as ‘the Redmen’); and the previous owners were CRC honorary life member Susan Donoghoe OAM and the redoubtable ‘Black Pete’, Peter Macartney. The naming of the quad scull Cootapatamba followed a tradition in Canberra, practised particularly by Black Pete, of invoking the names of lakes, streams, mountains and other natural features of the ACT, the Brindabellas, and the Namadgi and Kosciuszko national parks. Cootapatamba is Australia’s highest lake, a glacial lake nestling between Mt Kosciuszko and the Ramshead Range. It has never been rowed, but is often visited on ski and by foot by those named above. The Cup is made from an artillery shell fired with enthusiasm, but not in anger, towards the starting line of the race from Duntroon in a performance of Tchaikovsky’s 1812 Overture in 2005.